Do you crave adventure? Do you dream of piles of treasure? Do you have fantasies of making The Big Strike? 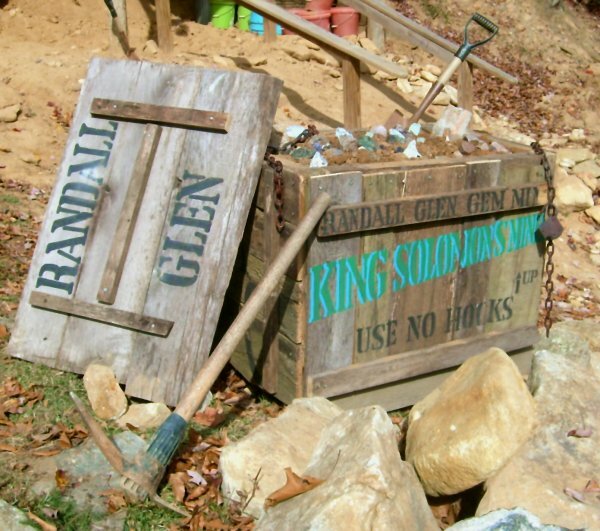 Then put on your Raiders hat and grab your shovel–when you dig into this treasure trove you’ll feel like you discovered King Solomon’s Mines! The King Solomon Chest is packed with more than a QUARTER MILLION carats of natural uncut gems. When you mine this trove you’ll find thousands of stones in this native dirt that comes right off our mountain. You might find Indian artifacts and some gold, too! And talk about treasure–you’ll find hundreds of stones of cuttable and specimen size. Imagine holding your own 500-carat ruby! How about a 1200-carat sapphire or an emerald the size of a tennis ball? We guarantee you’ll find specimen stones of over 1000 carats. In fact, the King Solomon Treasure Trove is so rich, you’ll need 5-gallon buckets to carry your finds. WE GUARANTEE YOU WILL NOT FIND A MINING EXPERIENCE LIKE THIS ANYWHERE ELSE IN THE WORLD.